In Kyrgyzstan, the first patients to be treated with the shorter regimen have just finished their treatment. Maxime was not even two when he was diagnosed with multi-drug resistant TB (MDR-TB), for which the normal treatment would take up to 24-months to complete. A treatment this long is tough for an adult, nevermind for a child as young as he was. Perhaps the only good thing which happened when he got sick, was that Kyrgyzstan had just started introducing a shorter treatment regimen for drug-resistant TB, with the assistance of the USAID-funded Challenge TB project. The shorter regimen is a 9 to 12-month treatment for drug-resistant TB and is designed specifically for patients who have never had TB before, such as Maxime. It is a much better alternative to the standard treatment, which takes two years to complete and includes eight months of daily injections and up to 20 pills every day, some of which cause severe side effects such as nausea, headaches and permanent damage to the stomach and liver. When they heard of the shorter regimen, Maxime’s family were relieved, even though nine months also seemed too difficult for such a small child. “What did he do to deserve this?” Maxime’s grandmother, Olga, kept asking, months after Maxime was diagnosed. 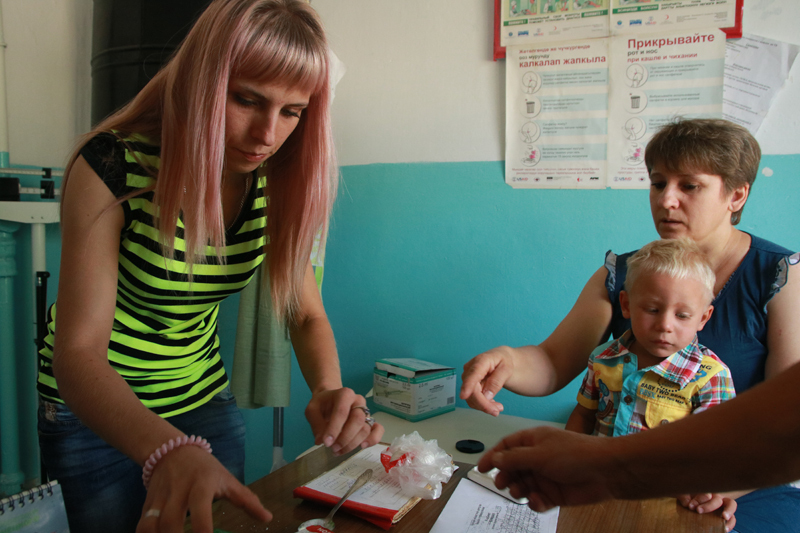 One by one Maxime’s family got TB, first his grandfather and then his uncle were infected with MDR-TB in early 2015, then his mother, Irina, was diagnosed with MDR-TB in December 2016, and finally Maxime was diagnosed in February 2017. 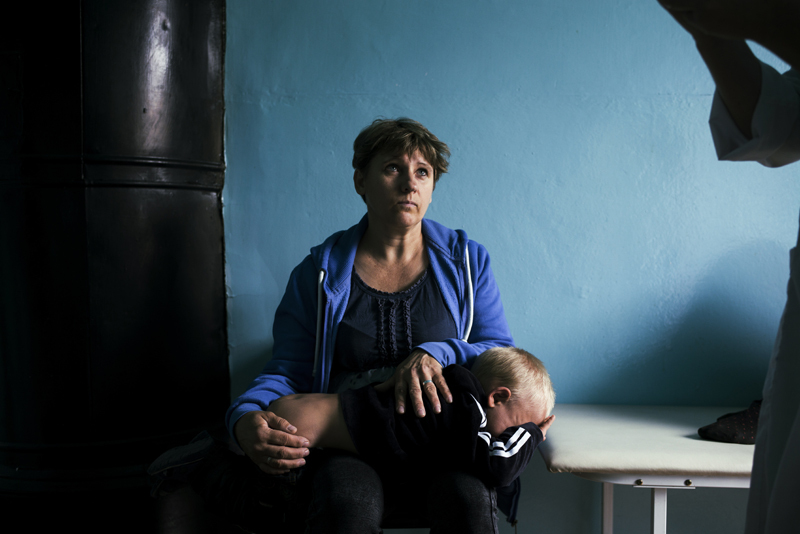 “During the first few weeks I couldn’t calm down, my whole family was infected with TB”, says Olga holding Maxime to her chest. 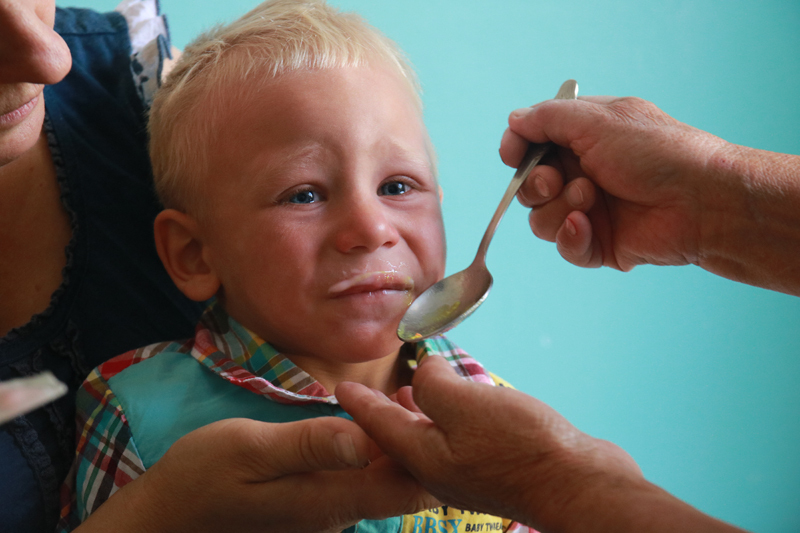 Maxime and his mother are now back home in their village in the Issyk-Ata region of Kyrgyzstan. They decided not to tell most of their relatives that they have TB because there is still too much stigma associated with the disease. Olga realized this when her sister-in-law visited them back when her husband had TB. She set the table for tea and gave everyone the same glasses and spoons, except for her husband, who was given disposable plastic dishes. It is a common misunderstanding that TB can be transmitted through physical contact, like the flu, and that even patients who are on treatment are still infectious. “The hardest is behind us,” says Olga, counting the remaining days until Maxime’s treatment finishes. With every family member finally recovering from TB, she is finally allowing herself to relax and be hopeful for the future. So far eight patients have been treated and cured using the new shorter regimen, and when Maxime finishes treatment in November he will be the ninth. The new regimen allows TB patients to complete treatment in half the time and at half the cost. Kyrgyzstan is planning to completely move to the shorter regimen and individualized regimens by the spring of 2018.